1 Place the cabbage in a saucepan, then add the butternut squash, runner beans, yellow, red and green peppers, scotch bonnet, spring onions, shallot onion, garlic, salt, pepper, thyme, the butter and the water and place the saucepan on the hob on a low heat. Cook for 20-25 minutes stirring occasionally, until the cabbage has softened. Then set aside to cool. 2 Meanwhile place the plain flour, xanthan gum and turmeric a cold bowl and mix. Then add the butter and quickly rub with your fingers until it looks like bread crumbs. 3 Then make a well in the middle and pour in the cold water and with your hand quickly pull flour into the water and kneed into a firm ball of slightly sticky dough. Do not over work it. Place the ball in cling film, wrap it and place in the fridge for 1 hour. 4 After an hour and the cabbage has cooled, remove the pastry from the fridge unwrap the pastry and place it on a sheet of baking paper with a dusting of flour. 5 Place another sheet of baking paper on top of the pastry and roll out the pastry with a rolling pin until it is about as thick as a one pound coin. 6 Get a bowl and place on the pastry and with a knife cut around the bowl. 7 Then place the circle on a baking tray covered with a baking sheet, then take a desert spoon and spoon the filling on one half of the circle about 1 cm away from the edge and brush the edge with the almond milk. 8 Fold the other half of the pastry over the filling to the edge and press down the edges, then seal with a fork and brush with the almond milk and prick with a fork (I do a v for vegan) to let out any excess steam. Repeat the process until all the pastry is used. 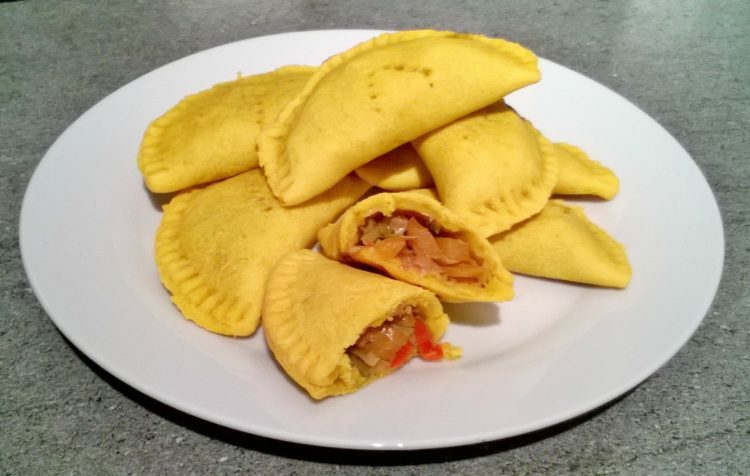 9 Then place your tray of patties in a pre-heated oven 200c/400f/Gas 6 for 15 – 20 minutes. Then remove and let them cool for 5 minutes before eating as they will be hot. Tip: If you want to freeze them, bake them for 10 minutes and then remove from the oven, when they have cooled down place the tray in the freezer when they have frozen place in a seal bag. To cook from frozen, place in the middle of the oven for 20 mins on 200c/400f/Gas 6.